Specific Media on Tuesday announced that they are offering a video version of their popular creative campaign testing technology which utilizes eye-tracking to optimize campaigns. The company’s popular creative program uses a 360-strong panel to test variations of creative campaigns before they launch, allowing advertisers to ‘fine tune’ their campaigns for their core audiences. The new tool uses the same EyeTrackShop tracking technology and examines how users interact with pre-roll advertising based on the type of pre-roll formats that are shown. 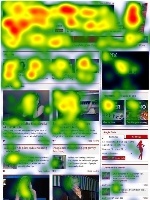 The company uses webcam technology to track a users eye movement and then charts where they spend most of their time viewing by creating a standard heatmap. The company has also revealed that they are working on ways to test the impact of audio and brand slogans within pre-roll advertising, while also examining how each pre-roll advert affects the impact of the video preceding the pre-roll spot.